On this blog back in February, I proclaimed my abandonment issues with Apple, Inc. I’m not the only old-timer to write at length in recent weeks about Apple’s corporate ideology ever since 1984 (an iconic year, to say the least, for Apple to switch from their former open box platform to a rigidly closed and controlled system). Cory Doctorow explained “Why I won’t buy an iPad (and think you shouldn’t, either)”, agreeing with me on just about every point, even our fond nostalgia for the pre-Macintosh Apple II series. (If I’d known I had so much in common with Cory, I’d have been less shy about talking to him when I met him at 3Pi-Con!) Tim Wu published an essay on Slate, “The Apple Two,” detailing the history of Steve Jobs, Steve Wozniak, and how the company they founded came to be what it is today. All of this has huge relevance to publishers, authors and readers everywhere given where the publishing industry is headed, but that will be an ongoing topic. Having gotten the grumbling out of my system, after I made that post, I sent an email off to the only contact I could derive from Apple’s website, their Developer department. I received a reply giving me the contact information for the iBookstore. I emailed them. After that, I didn’t hear anything further, and in the meantime, the whole “agency pricing model” wrangle with Amazon and Macmillan was going on, and the other Big Publishers (all but Random House, still holding out at this writing) were signing up with Apple, and I saw a rumor somewhere that Apple had posted a job opening for an iBookstore liaison for small publishers. But the April 3 launch date was approaching fast, and it didn’t appear that Apple was going to have infrastructure in place to add thousands of books from hundreds of small publishers by then, even if they planned to eventually do so. On March 30, I got an email from Mark Coker, founder of Smashwords. He’d been playing things pretty close to the vest–and given the volatility around the whole launch of the iBookstore and the dust-up with Amazon, it’s no wonder–but he was announcing, initially just to his own clients, that Smashwords had just signed a deal with Apple to supply titles to the iBookstore. Apple had a package of firm guidelines, including pricing formulas, strict compliance with ePub standards and the requirement that every title have a unique ISBN. To meet those guidelines, Smashwords had become an ISBN reseller like Lulu and a few other companies, selling individual ISBN numbers to authors who needed and wanted them. We had about 48 hours to bring our titles up to Apple’s standards and make the first shipment to the iBookstore, which would happen in time for its launch. Fortunately, BLUM’s titles were all ready to go, ISBNs and all–except for Apple’s rule that all prices must end in .99. I had decided to set “round” prices a while ago for several reasons and now I had to drop all the Smashwords editions by one cent. But when the 500-pound gorilla is being that friendly, I’m not going to balk at a little concession or two. On April 1, Smashwords announced that it had shipped BLUM’s titles in the first big batch to Apple. Since then, Apple has signed with a number of other ebook aggregators, including several that carry BLUM’s books. 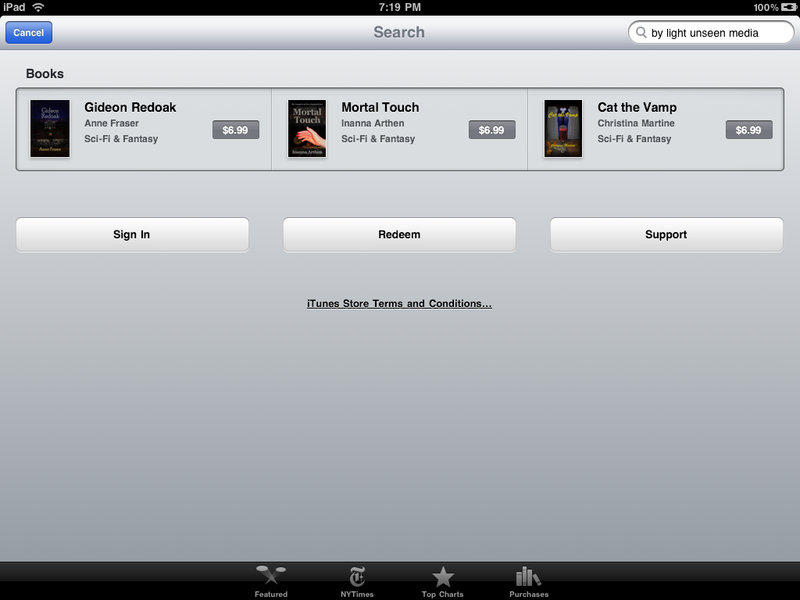 If you own an iPad and prefer to read the Kindle edition or the Kobo edition, you can get those on your iPad, too. Apple doesn’t seem to be choosy about big name publishers or mainstream books, either. Many of these aggregators carry thousands of self-published titles, with all the, shall we say, diversity of quality control standards those display. As long as they meet Apple’s specifications, Apple will offer them all. So, Apple: I have to take back some of what I said. You are carrying independently published books and your customers can read them on their iPads. That’s great! Accept a virtual handshake from one of your new partners, By Light Unseen Media. The iPad is a nifty little device, and if I had hundreds of dollars of play money burning a hole in my pocket (alas, I don’t) I might buy one. (What is more likely is that I will pop for the “developer” license fee so I can get multi-media content onto Apple platforms. That’s a bit further down on the To Do List at the moment, though.) It will be interesting to see where things go from here. Apple “unveiled” the iPad on January 27. It has been greeted with highly variable reactions from the customer base. Many devoted fans of the Apple Macintosh family of computers have been waiting eagerly for a “netbook” solution of their very own. The iPad doesn’t seem to be that solution. I won’t summarize the criticisms, but you can read one techie review here. There are people who can’t wait to get their hands on the iPad, and hey–more power to them. But they seem to be less numerous than Apple hoped. However, much is being said about the supposed impact of the iPad on publishing. The iPad is intended to be far more than “an e-reader,” but it can be used as one. Apple is creating an iBookstore, like the iTunes store, through which iPad users can buy and download books. In advance of the iPad announcement, Apple negotiated deals with five of the “Big Six” publishing conglomerates to make e-books available in the iBookstore. Only Random House has held out so far. iBookstore e-books will generally be higher-priced than e-books sold through other venues, including Amazon’s Kindle Store. Apple’s so-called “agency model” for acquiring e-books has contributed to some recent high-profile inter-corporate wrangling among Amazon and Big Publishers. But that’s a topic for another post. This corporate attitude doesn’t surprise me. I’ve had a beef with Apple since they first released the Macintosh in 1984. Until then, I rather liked them. I developed software for the Apple II series (IIe and IIc) in the early 80s. They were fun little machines–and they were open machines. You could pop off the cover and install cards in expansion slots–even cards from third party vendors, I seem to recall. You could get documentation from Apple and program away, without paying a big annual fee for “developer” privileges like you do now. Indeed, you kind of had to, because there wasn’t much commercially packaged software available for the Apple II series. The Macintosh changed all that. It was released as a closed system (leading to a fruitless “open the Mac movement”) and the first model didn’t have enough memory for its own operating system (leading to the release of the “fat Mac” with the minimal memory the Mac should have had in the first place). You can read a detailed history of the Macintosh here. But along with the Macintosh, Apple adopted its permanent new corporate policy. Apple became, and still is, one of the most proprietary, territorial, homogenous, dedicated-singular-platform corporations around. Apple’s attitude is: “we do it all for you, we do it better than anyone else, you don’t need anyone else, and if you want our products and services, you can’t use anyone else’s.” Apple, like Disney, has created its own xenophobic universe. Apple isn’t interested in cross-platform compatibility. Your iPod will play MP3s but you can’t play iTunes music on anything but an Apple product (either hardware or software.) Apple practically wrote the book on DRM. When it comes to technology, Apple doesn’t believe in polluting the genome. In addition to this, Apple’s pricing structure, across the board, is comparatively high, and you have no choice but to pay it, because there are no generic equivalents. That’s why as a small independent publisher, I’m just following the news about the iPad for reference. Apple won’t sell By Light Unseen Media’s books, and iPad users won’t be reading them–at least not on their iPads. In any event, Apple is not stressing the iBookstore in its iPad promo–it’s buried halfway down the iPad Features page on Apple’s website and Steve Jobs brushed over it when he gave his big presentation on January 27, even though that presentation was made at Digital Book World. I expect that the iPad has far more potential to radically change the periodicals industry–magazines and newspapers, things that people subscribe to, read, and discard–than book publishing. I’m definitely not “boycotting” Apple. I have an iTunes account and Quicktime Pro, I buy iTunes and iPod products for my niece and nephew. My business model is to work with every vendor and distribution channel for By Light Unseen Media’s titles that exists, without prejudice–if they’ll let me. Apple isn’t the only e-book vendor to cold-shoulder small publishers. After multiple queries, Sony finally replied to me about the Sony Reader Store…by telling me to sign up with Smashwords and quit bothering them. By then, I already had set up with Smashwords, a couple of months earlier, but By Light Unseen Media’s titles still don’t show up in Sony’s store. Barnes & Noble’s e-book store also will only take small press books via Smashwords, but they, at least, list our titles. Aaron Pressman makes a good case for his thesis that Big Publishers really want to kill e-books altogether. It’s a safe bet that bookstores, both indie and Big Box, would love to send every e-book to a shallow grave. What do readers really want? It doesn’t look like anyone connected with Apple, Sony, or the Big Six publishing conglomerates could care less.